CANNA, the specialist in coco production and famous for its high quality CANNA COCO medium in 50 liter bags, has received many requests over the years for coco in a compressed form but with the same high quality. CANNA would only consider introducing a brick if it would really be different than any other brick available. This brick makes life easier in many ways: it is easy to use and it saves the grower time, money and effort. 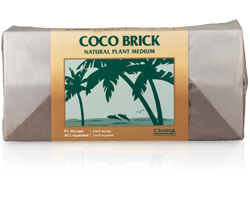 Be the first to review “CANNA Coco Brick (40L EXPANDED)” Click here to cancel reply.